The apartment house lobby was empty this time. No gunman waiting under the potted palm to give me orders. I took the automatic elevator up to my floor and walked along the hallway to the tune of a muted radio behind a door. I needed a drink and was in a hurry to get one. I didn’t switch the light on inside the door. I made straight for the kitchenette and brought up short in three or four feet. Something was wrong. Something on the air, a scent. The shades were down at the windows, and the streetlight leaking in at the sides made a dim light in the room. I stood still and listened. The scent on the air was a perfume, a heavy cloying perfume. A writer who is afraid to overreach himself is as useless as a general who is afraid to be wrong. Technique alone is never enough. You have to have passion. Technique alone is just an embroidered potholder… The moment a man begins to talk about technique that’s proof that he is fresh out of ideas. The most durable thing in writing is style, and style is the single most valuable investment a writer can make with his time. It [style] is a projection of personality and you have to have a personality before you can project it. It is the product of emotion and perception. Don’t ever write anything you don’t like yourself and if you do like it, don’t take anyone’s advice about changing it. I am a writer, and there comes a time when that which I write has to belong to me, has to be written alone and in silence, with no one looking over my shoulder, no one telling me a better way to write it. 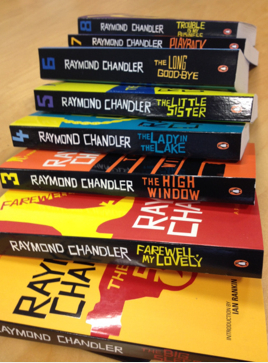 It doesn’t have to be great writing, it doesn’t even have to be terribly good. It just has to be mine. WHY: As a longtime fan of hardboiled detective fiction and film noir, and an aficionado of found poetry, I wondered what would happen if the two were combined. A call for submissions on the Silver Birch Press blog, as well as requests from our contributing editors to their colleagues resulted in a wide range of submissions, including those featured in the Silver Birch Press NOIR Erasure Poetry Anthology. WHAT: So just what is an erasure poem? Take a page from any book, cross out or whiteout some of the words and the remaining words constitute the erasure poem. 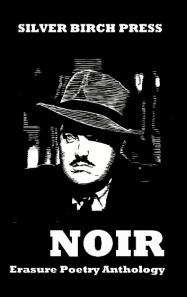 The Silver Birch Press Noir Erasure Poetry Anthology pays homage to noir authors—including genre founders Raymond Chandler and Dashiell Hammett, as well as other authors of crime fiction whose work served as source material. DEDICATION: Noir and erasure poetry are a perfect match—stark, pared down, elemental, bare bones. As the author who invented L.A. 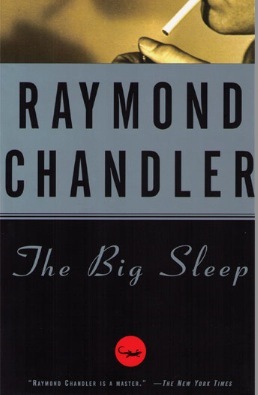 Noir and elevated prose to poetry, we dedicate the Silver Birch Press NOIR Erasure Poetry Anthology to Raymond Chandler. WHERE: Find the Silver Birch Press NOIR Erasure Poetry Anthology — an interesting, unique (and inexpensive) holiday gift for lovers of crime fiction (and poetry!) — at Amazon.com. The soon-to-be-released Silver Birch Press Noir Erasure Poetry Anthology features poems by over 40 poets around the world who based their work on the writings of about 20 different noir authors. 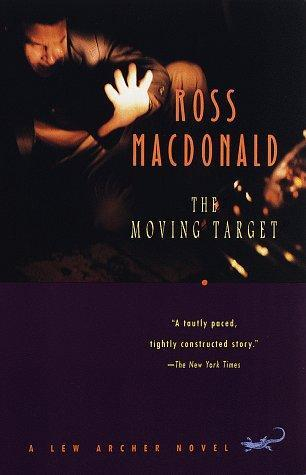 No surprise, I’m sure, is that by far the most popular authors were Raymond Chandler (16 poems based on his work) and Dashiell Hammett (9 poems based on his work), with Ross Macdonald coming in third (three poems based on his work). Other classic authors represented in the collection include James M. Cain and Cornell Woolrich, with some current day authors (Dennis Lehane, Walter Mosely, and others) filling out the collection. Erasure poems are created by photocopying a page from a book, then marking out, whiting out, or in other ways (see examples), eliminating some of the words. The remaining words constitute the erasure poem. The Silver Birch Press NOIR Erasure Poetry Anthology will be released by Dec. 1, 2013. A special thank you to contributing editors Jenni B. Baker, Catfish McDaris, james w. moore, and Gerald So for their fabulous work in bringing fellow authors into the collection and helping spread the word. Available by December 1, 2013: Silver Birch Press NOIR Erasure Poetry Anthology — a collection of poems from authors around the world based on the writings of hardboiled detective novelists such as Raymond Chandler, Dashiell Hammett, and Ross MacDonald. A special thank you to Guy Budziak, of filmnoirwoodcuts.com, for his beautiful cover art. We were close to Del Rey before she spoke to me for the first time since we left the drugstore. Her voice had a muffled sound, as if something was throbbing deep under it. 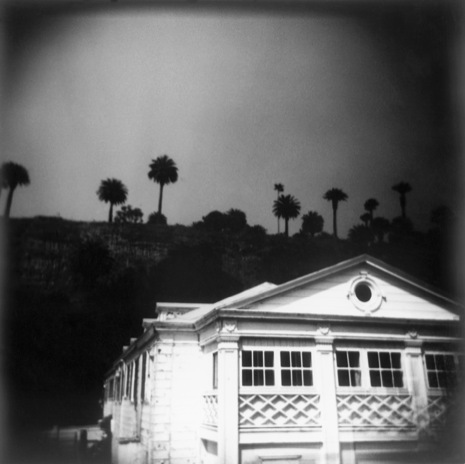 The above photo and passage from Raymond Chandler‘s novel The Big Sleepappear in the superb photo collectionDaylight Noir byCatherine Corman, with a preface by Jonathan Lethem. A series of photos from the book — including the photo of the Del Ray Beach Club above — were featured in a review by Rollo Romig in The New Yorker (October 7, 2010). 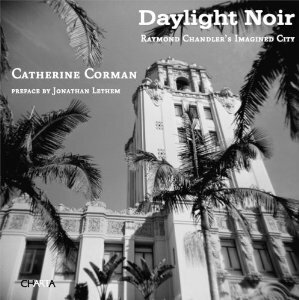 Find Daylight Noir by Catherine Corman at Amazon.com. THE NIGHT GOES ON ALL NIGHT: Noir Inspired Poems, edited by Rick Lupert (Ain’t Got No Press, November 2011) was published in conjunction with the 2011 Los Angeles Poetry Festival’s “Night and the City” Noir Festival. 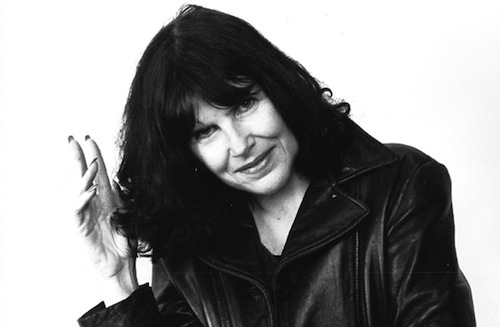 The collection features work from 24 poets who, according to the book description, explore “their own noir-de-vivre with humor, grit, nostalgia, and the requisite fedora.” The book includes an introductory note about noir from Los Angeles Poetry Festival director Suzanne Lummis. CONTRIBUTORS INCLUDE: E. Amato, Michael C. Ford, Michael Cluff, Brendan Constantine, Mike Daily, Gloria Derge, Peggy Dobreer, Jerry Garcia, Joelle Hannah, Kris Huelgas, Elizabeth Iannaci, Jack Bowman, Ruth Nolan, Marc Olmsted, Kevin Patrick Sullivan, Angela Penaredondo, Douglas Richardson, Anthony Seidman, Eric Steineger, Eric Tuazon, Mehnaz Turner, Wyatt Underwood, Wanda VanHoy Smith and Florence Weinberger. dark glasses between the house & the garage. Note: Brendan Constantine will appear at the POET NOIR reading at the Bradbury Building in downtown Los Angeles on Sunday, Nov. 24, 2013. Details here. ABOUT THE EDITOR: Rick Lupert has been involved in the Los Angeles poetry community since 1990. He served for two years as a co-director of the Valley Contemporary Poets, a non-profit organization that produces readings and publications out of the San Fernando Valley. His poetry has appeared in numerous magazines and literary journals, including The Los Angeles Times and Chiron Review. He edited A Poet’s Haggadah: Passover through the Eyes of Poets anthology and is the author of thirteen books. Since 1994, he has hosted the long-running Cobalt Cafe reading series in Canoga Park and is regularly featured at venues throughout Southern California. Rick created and maintains the Poetry Super Highway, a major internet resource for poets. (PoetrySuperHighway.com) Currently Rick works as a music teacher and web designer and can be reached by email at Rick@PoetrySuperHighway.com. 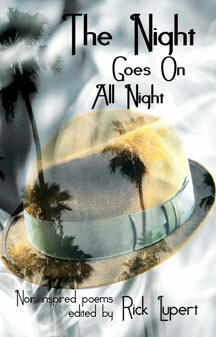 Find the 56-page THE NIGHT GOES ON ALL NIGHT: Noir Inspired Poetry at Amazon.com. WHEN: Sunday, Nov. 24, 2013 from 2:30-3:30 p.m.
WHERE: Downtown Los Angeles. Details here. Listen to a September 2013 interview with Suzanne Lummis on NPR’s “All Things Considered” at this link.